NEW YORK—Once in a while, The Metropolitan Museum of Art brings out of its storage vaults some of its rarely seen treasures for a short stint. The “Gilded Age Drawings at The Met” is such an exhibition. It features late 19th-century American works on paper, created and acquired shortly after The Met was founded in 1870 during the Gilded Age. Works on paper, including watercolors, pastels, and graphite and charcoal drawings, are especially vulnerable to light, so the exhibition is running only through Dec. 10. 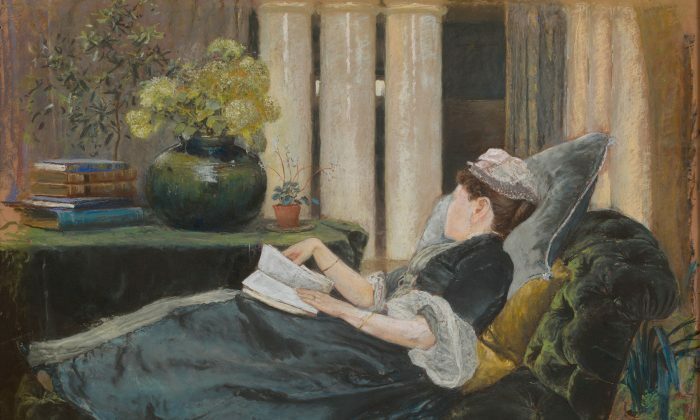 You will see the names of iconic artists of the period, including Mary Cassatt, Thomas Eakins, Winslow Homer, John Singer Sargent, and Louis Comfort Tiffany, as well as new acquisitions by Cecilia Beaux, John La Farge, and Sargent. 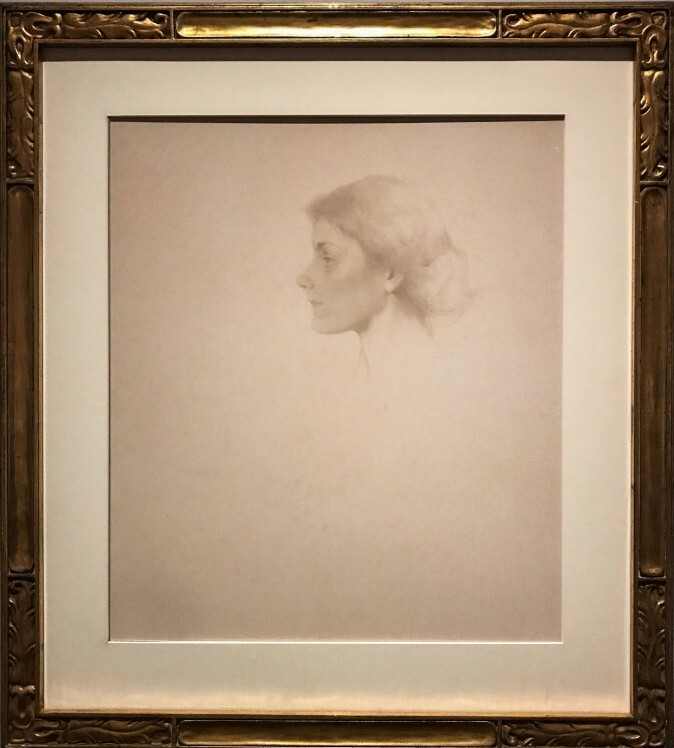 But of the more than 30 works on display, it’s an exquisite silverpoint drawing, “Portrait of a Woman” by Thomas Wilmer Dewing (1851–1938), that in itself is worth making a short visit to The Met (straight to gallery number 746 in the American Wing). Dewing favored depicting upper-class women in genteel environments—a popular subject of the Gilded Age. This silverpoint drawing is simply a portrait of a woman in profile. The ancient method of applying a silver stylus to prepared paper gives way to gradual oxidation of the silver line. It can result in an incredibly delicate image, which Dewing mastered beautifully. Any photograph of the drawing cannot do it justice, because the lines and shading, and the luminosity depicted, are so subtle. Dewing chose a short range of lights to darks to render this drawing, so he had to abbreviate to a ridiculous degree. As he was able to maintain the proper relations between the values—from the shadows to the highlights—the drawing looks effortlessly natural. Although he reduced so much visual information from looking at his subject to create the drawing, the drawing itself does not look overly simplified. It still looks complete. In all its completeness, Dewing still does not hit you over the head with the representation of the woman he has drawn. There is still space for the viewer to breathe into the drawing, so to speak. He portrays a beautiful woman without sentimentality, allowing you to appreciate the artistry in how he depicts the woman’s beauty even more. 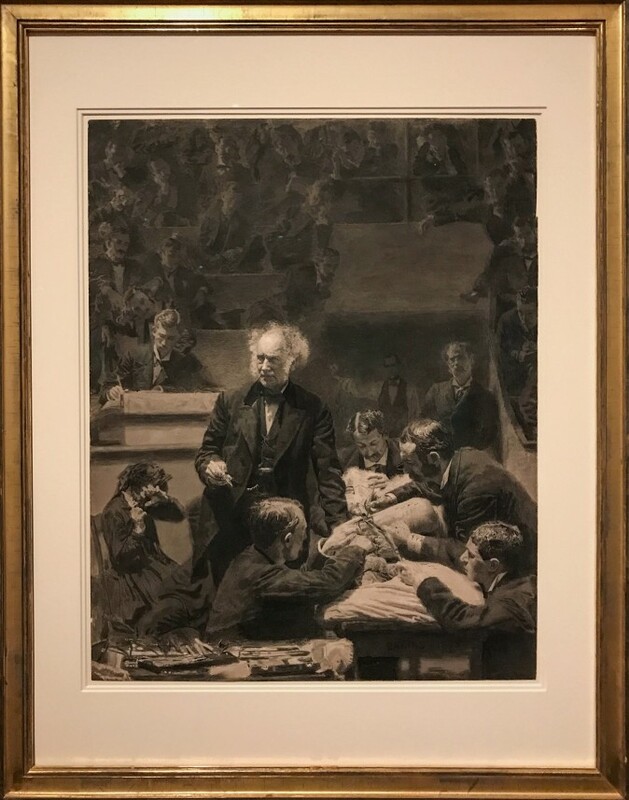 Another drawing in the exhibition that was just as stunning, but in far contrast in terms of subject matter, is “The Gross Clinic” by Thomas Eakins (1844–1916). This ink-wash is a small version of Eakins’s most ambitious “environmental portrait,” an oil painting of Dr. Samuel D. Gross (in the permanent collection of the Philadelphia Museum of Art). The large oil painting was considered too shocking in its realism to be displayed at the 1876 Centennial International Exhibition for which Eakins made the masterwork, so it was displayed in a model U.S. army field hospital exhibit instead. We see the world-famous surgeon, at center stage of the surgery theater, pausing to instruct students at the Jefferson Medical College in Philadelphia. Gross is demonstrating the relatively new surgical procedure he had developed to treat bone infections. The way Eakins rendered this medical scene can make you gasp, perhaps more from how vividly he brings this scene to life than the blood and guts aspect of the subject matter. Eakins depicts a noble character in the 70-year-old Dr. Gross—who wears a black frock coat and holds a knife with a bloodied hand. 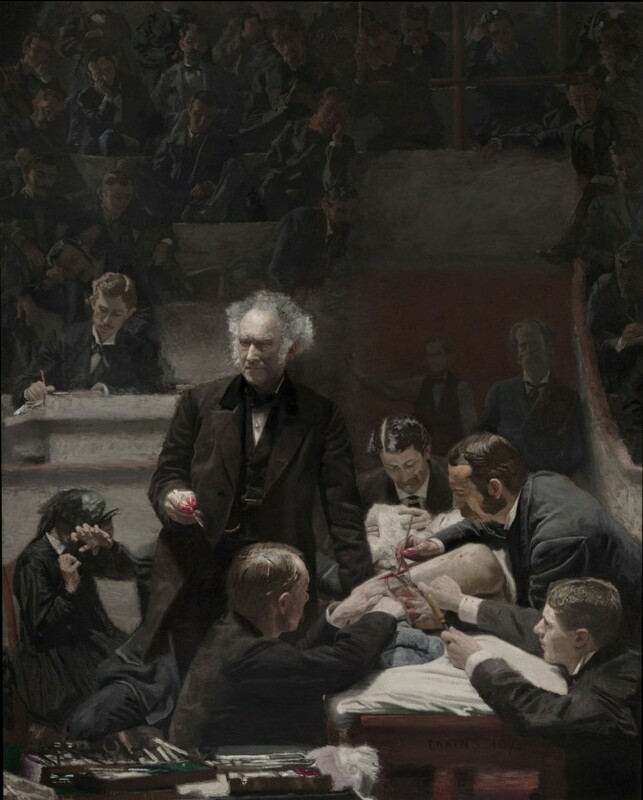 Eakins shows the piercingly focused, rational, and calm demeanor of the professor, especially in the eyes, as he pauses to explain the procedure. All the while, in the lower-left corner, the patient’s mother recoils, hiding her face in horror. The students in the background, looking like ghostly figures, are taking notes as a matter of routine. The display of knives and other surgical tools in the foreground highlight the sharp practicality of the whole operation. Today, “The Gross Clinic” is considered one of the greatest American paintings ever made. The smaller ink-wash version at The Met is just as arresting, even in black and white and at a smaller scale. Eakins painted it so that an accurate black-and-white photographic reproduction could be made from it.